In 1984 Ercole and Angiolina Velenosi started a vineyard and winery that they felt would combine tradition and innovation in the beautiful hills just to the north of the city of Ascoli Piceno in the southern part of Le Marche. Beginning their production with French varietals such as Cabernet Sauvignon and Chardonnay, they later switched to traditional local grapes such as Montepulciano, Sangiovese, Pecorino and others. Today, on over 80 hectares of land where the Adriatic sea breezes combine with a soil that has been growing wine grapes for over two thousand years, they produce 21 different wines, both red and white, dry and sparkling. Their sales today total over 2,000,000 bottles per year, quite a growth in just thirty years. Owner and President Angiolina Velenosi, honored with the title of Cavaliere or Knight for service to the industry, explained that she has assembled a topnotch team that continues to work to implement the founding philosophy. On the beautiful fall day when we visited the Velenosi winery, after a brief meeting with Signora Velenosi, an old friend, Ulisse Patalocchi La Rosa, Velenosi’s Export Manager, conducted our tour of the vineyards and subsequent tasting. Velenosi’s Angeolina Velenosi looks through a glass of Passerino.PHOTO: TERRI DUARTE[/caption]After a brief tour of the vineyards we moved to the tasting. We began the white wines with Passerina Brut sparkling wine, a 100% Passerina grape offering made with the Charmat Method. I am not a sparkling wine fan, but this pale yellow wine with a fruity nose was really very good. I don’t rate sparkling wines as I don’t feel that I know enough about them. The second offering was a 2014 Villa Angela Offida DOCG Pecorino. 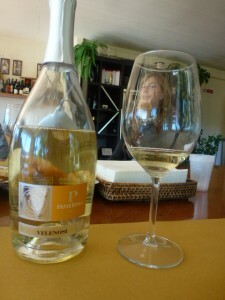 This 100% Pecorino grape wine, aged only in stainless steel, was light straw in color with a pleasant fruity nose. It finished very smooth and long. It was an excellent example of Pecorino and I rated it a 90. Our third white was a 2014 Querciantica Verdicchio dei Castelli di Jesi DOC Classico, a 100% Verdicchio wine made in Ascoli Picoli. Pale yellow in color with the normal complex Verdicchio nose, it finished very long and smooth. I liked this wine a lot and rated it a 90. Next we tried the reds. The first red was a 2014 Querciantica Lacrima di Morro DOC, a 100% Lacrima wine that was deep ruby in color with the very different and unique Lacrima nose. It finished medium long and smooth. I rated this different but pleasant wine a 90/91. These Lacrima wines are very interesting. Il Brecciarolo, a 2013 Rosso Piceno DOC Superiore followed. This wine, a 70% Montepulciano and 30% Sangiovese had fermentation and maceration of twenty days at controlled temperatures followed by one year aging in used barriques. It was purple in color with a strong leather nose. This was a big red wine with a long and smooth finish. I rated this wine a 92. Our next wine was a 2012 Brecciarolo Gold Rosso Piceno DOC Superiore. Made from 25 year old vines this 70% Montepulciano and 30 % Sangiovese wine had a 20 day fermentation and maceration on the skins, followed by aging of 12 months in new barriques. The color was deep purple and it had a strong, leather nose with hints of fruit. Its taste started mid palate and finished very long and smooth. This was an excellent Rosso Piceno that I rated a 94. A 2010 Roggio del Filare Rosso Piceno DOC Superiore was the next offering. Another 70% Montepulciao and 30% Sangiovese wine made from 40-50 year old vines, it had a 28 day fermentation and maceration on the skins and was aged in oak barriques for 18 months. The color was deep purple and the nose a combination of Montepulciano fruit and Sangiovese leather. It finished very long and exceptionally smooth. I rated this superb Rosso Piceno a 95. The last dry red was a 2011 Ludi Offida DOCG Rosso, a blend of 50% Montepulciano, 25% Cabernet Sauvignon and 25% Merlot. Following a 25 day fermentation and maceration on the skins, this wine is aged for 24 months in barriques and then 12 months in the bottle. The result was a deep violet color and a lighter nose. The finish was that of an elegant European style wine, very smooth. I rated this wine a 94. We finished with a unique desert wine made from 80% Lacrima grapes and 20% cherries. It had an amazing fruit nose and a sweet finish. Served cold, this would be an excellent desert wine. I would like to thank Signora Velenosi and especially Signor La Rosa for the wonderful hospitality they showed to us during our visit. The Velenosi wines we tasted were a tribute to the philosophy of the winery. I highly recommend them. « Is QPR dying, or is it just me?